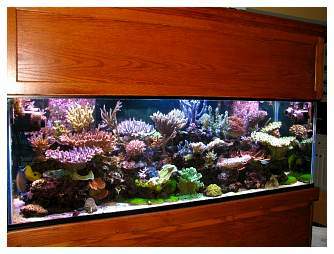 Browsing around Reef Central has become one of my favorite pastimes, and I’m thrilled to have my display chosen as a ‘Tank of the Month.” It feels like I just got picked for the Varsity Team. I’ve kept all things aquatic for as long as I can remember. 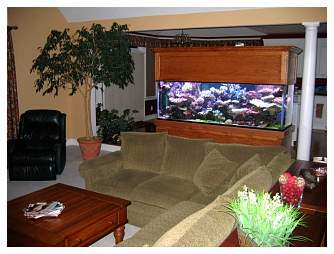 I maintained a large freshwater “Amazon” tank for many years, and at one point its live food budget was bigger than my own food budget! 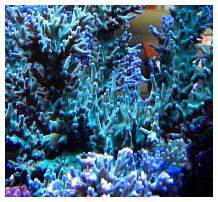 In the early 1980s I briefly tried to keep a saltwater display with a few fish and anemones. I soon returned to freshwater as the hobby-level technology of the day didn’t provide a very healthy environment for the specimens, and the system never seemed to thrive. My family bought me a 90-gallon basic saltwater setup for my 40th birthday. 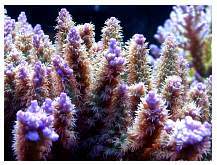 Around that time I saw an example of a beautiful private captive reef and then read the first Sprung/Delbeek book - I was solidly hooked! 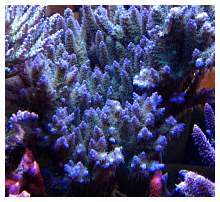 Several tanks and almost 10 years bring me to my current 180-gallon small polyped stony coral display, which I set up three years ago. Those of us with spouses or significant others are well versed in the art of negotiation, creative budgeting and, most importantly, taking advantage of any opportunity to upgrade our systems. Three years ago my wife wanted to get new furniture for our “great room,” and I heard opportunity knocking loudly! 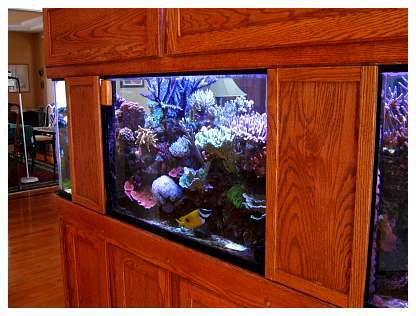 My 92-gallon corner display didn’t fit the new landscape, so we decided to upgrade to a 180-gallon reef tank. 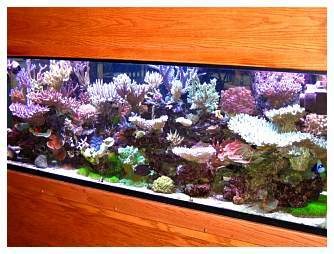 Our budget allowed for a stock reef-ready All Glass tank with dual megaflow overflows. One of the challenges in setting up the new tank was a lack of walls. The great room was entirely open on two sides, and the remaining walls were already filled by windows and a fireplace. 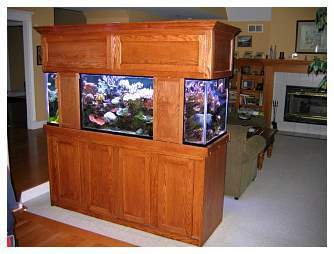 Thus, the new tank had to be “freestanding,” viewable from all sides, with cabinetry that fit the décor. I decided that my skills and tools did not match what we wanted, so I ordered an oak plywood stand and hood from a cabinet maker over the Internet. After some glue, screws, stain and a bit of crown molding, I ended up with a beautiful stand and canopy. The stand was built tall, and the entire system stands nearly seven feet tall. Another of the many difficulties in setting up a freestanding tank, particularly one that was not custom designed, was how to hide the electrical conduits from the hood. This was solved by creating wood panels, offset by ½ inch runners, attached to the backs of the overflows with Velcro tape. As a bonus, it hid the overflows' ugly backsides. I’m not a good carpenter, and I’m an even worse plumber. That meant the sump had to be in the basement to allow for drips, spills and general clutter. We removed an electrical outlet plate in the floor to allow access to the basement below. 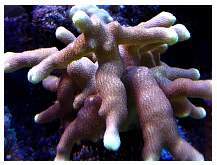 My hope was to create an SPS dominated system, using captive-grown specimens whenever possible. 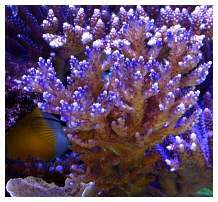 I am always impressed by tanks “filled’ with mature stony corals, with colonies virtually growing together, so I stocked my new tank with this future vision in mind. 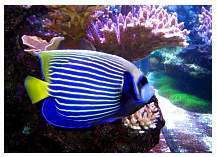 I love fish, too, so I planned to add a few large herbivorous specimens, and thought I might even add an Emperor angelfish someday. 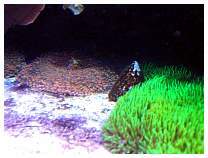 My previous reef tanks utilized a deep sand bed for filtration and nutrient processing. 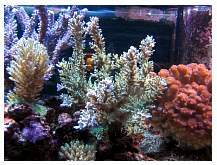 With each of those tanks, at about the three-year point I noticed an increase in unwanted algae, unexplained tissue recession and a general “decline” in the SPS. 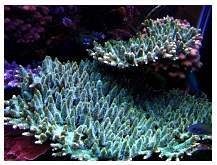 Several threads were active on Reef Central at the time regarding a new take on an “old” method of reefkeeping - the Berlin method. The idea was to forgo substrate, using aggressive skimming and modern high-flow devices to remove detritus before it had the chance to break down. Live rock would handle additional nitrate processing. A dense marine stabilized plastic board, Starboard, was used to add a protective reflective surface on the bottom of the tank. It occurred to me that a deep sand bed might be analogous to a terrestrial septic system—it will work very well until it fills up, and then you’ve got big problems! I couldn’t understand how a DSB could last “forever” in a closed system, so, faulty logic or not, I decided to set up my new system “bare bottom.” I honestly have not missed the sand at all, and I like the ability to direct flow wherever it’s needed without worry of a sandstorm. 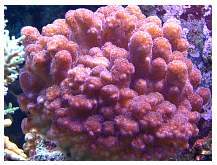 Over time, the Starboard matures and becomes covered with polyps and coralline algae and actually looks quite nice. The debate over “sand or no sand” still rages at Reef Central. 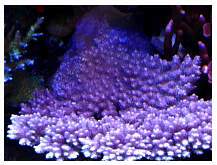 I think both methods are quite workable; however, in my opinion, a substrate-free tank is a better approach for an SPS dominated display, particularly a system that must support a heavy input of nutrients from feeding the fish. Excellent circulation was important for this tank for two reasons: coral heath and assuring that the detritus remained suspended in order to travel to the sump for removal via vacuum or skimmer. I installed two Tunze 6080 powerheads, which turn on and off every hour or two via a mechanical timer, in the upper opposing corners. To add to the random flow, I use an OceanMotions revolving drum device to send the sump's return flow to alternating sides of the tank. The return is powered by a GRI 520 pressure rated pump, plumbed in series with a GenX Mak 4 pump for redundancy. To “kick it up another notch” I capped the returns with eductors, thus greatly enhancing the in-tank random flow. I have no idea what the actual flow rate is in my tank, though I’d guess it’s well into the thousands of gallons per hour range. 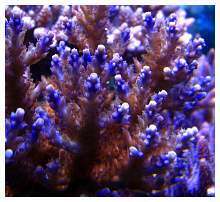 I’ve come to believe that flow is at least as important as lighting for successfully keeping SPS corals. 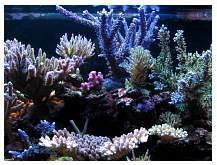 Efficient skimming is important in a substrate-free tank. 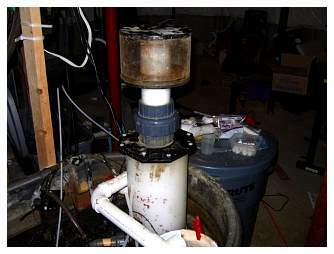 I use a DIY needle-wheel skimmer (built by someone with skills), standing 34 inches tall and driven by two Sedra 5000 pumps. It’s not pretty, but seems to do the job well. 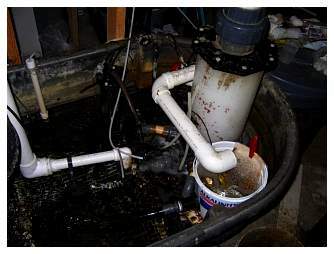 The sump is “bare” and acts as a large settling tank for heavier detritus. 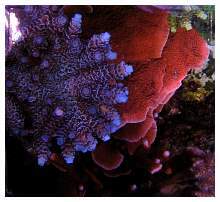 I keep a bag of carbon at the skimmer's outflow, and sometimes use a bit of ozone to improve the tank’s water clarity. Granular ferric oxide is used at times to keep phosphate in check. 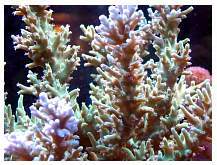 I keep a rack of coral fragments at the end of the sump under whatever bulb I happen to have around. I needed good lighting because I planned to keep mostly SPS corals. The light hood contains two 72” VHO actinic lamps, driven by an Icecap ballast, with two 250-watt bulbs on either end driven by electronic ballasts. In the center I have a 400-watt bulb, driven by a PFO HQI ballast. 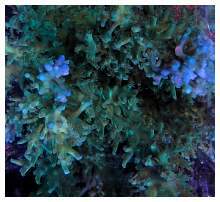 This allows me to center the “light hungry” corals, and put lower light requiring species at the sides. I generally use 10K bulbs, though at the time of this writing I have a 14K Hamilton bulb in the middle flanked by Reeflux 10K bulbs on the sides. The lights are controlled by simple mechanical timers, with the VHO bulbs providing a dawn/dusk effect. I replace all of my top-off water with kalkwasser. I have a decidedly “low tech” system; I simply fill a 40-gallon Brute trashcan (photo right) with RO water and kalkwasser, stir it for a few minutes, then forget about it until the next week. 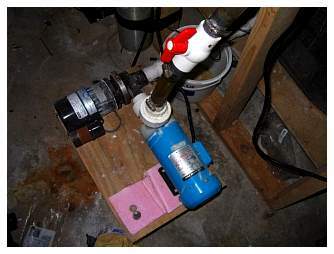 The kalkwasser is fed via a peristaltic pump attached to a float switch in the sump. 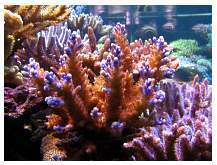 I keep many large SPS, so I also use a calcium reactor to maintain calcium and alkalinity. 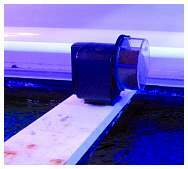 This is another DIY device (again, not my handiwork) filled with cheap Geo-Marine substrate. 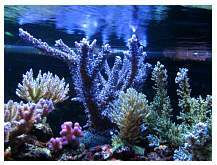 I change about 15 gallons of saltwater weekly while vacuuming the remaining detritus from the display and, to a much greater extent, the sump. I literally do vacuum the system, using a small ShopVac set aside for just this task. I clean the glass, all around, twice weekly, and of course spend hours tinkering with things that are working fine already. I try to keep the display at 78-80° F year-round, sometimes a bit higher in the summer and slightly lower in the winter. The large sump in the basement functions nicely as a chiller. A fan over the sump kicks on when the temperature exceeds 81° F, which is rare. I use two 300-watt Ebo-Jaeger heaters to warm the tank in the winter. I house several large fish in the display, including a Sailfin tang, a Foxface Lo, a Kole tang, a Flame hawkfish and, my favorite, an Imperator angelfish. 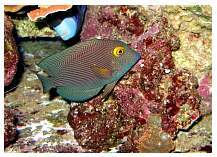 Angelfish have a reputation for having a taste for corals…and indeed they do. 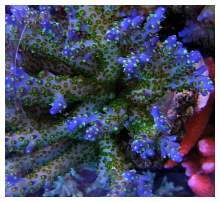 As a juvenile, the Emperor mowed down some fairly ugly zoanthids and a few purple mushrooms. 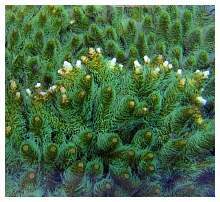 Sadly, it won’t touch the ever-encroaching green star polyps. 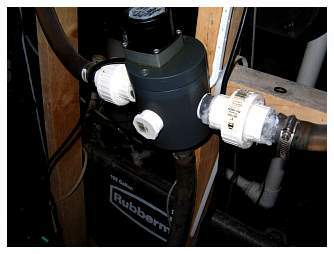 As an adult it occasionally nips at SPS, a habit that seems much improved after adding an auto-feeder to the system. 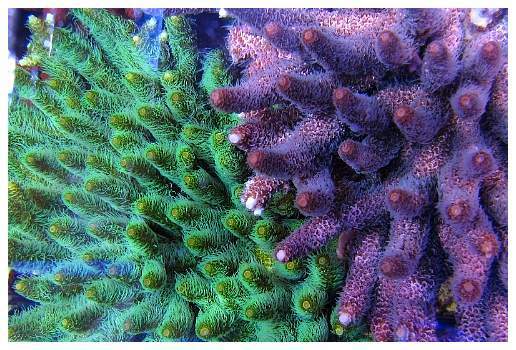 I’ve noticed much more aggressive branching in the slightly nipped corals, a welcomed side-effect. 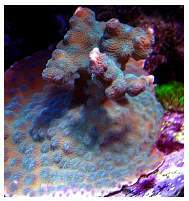 I have a single Tridacna maxima clam that has been with me for years. There are a few shrimp, several large snails, and several tigertail cucumbers from my previous sand-bottomed system that, interestingly enough, seem to thrive without sand. 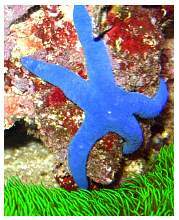 I have a blue Linckia starfish and a huge, 12+ inch diameter, rarely seen serpent star. 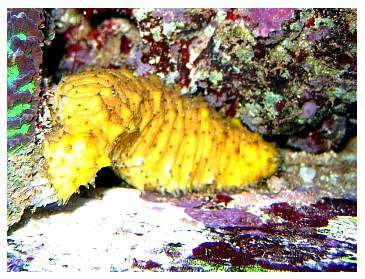 Surprising populations of bristle worms, tiny starfish, mysid shrimp and pods are apparently nicely supported by the live rock alone. I never feed the SPS directly. I do, however, feed the fish a lot! I generally feed them a generous tablespoon of Formula One large marine pellets daily, along with a playing card sized piece of Nori. 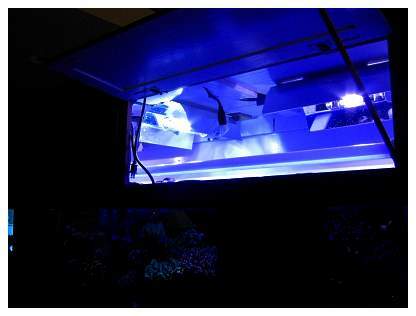 An autofeeder (photo left) sprinkles some Spectrum pellets during the workday to keep the Emperor angelfish off the corals. The results at the “other end” of the big fish are impressive, and I believe this, in turn, nourishes the SPS, either directly or via bacterial growth. The tank is visibly filthy for a time after feeding, but clears up quickly from the aggressive flow and skimming. I have come to believe that this “temporary filth” contributes to the incredible growth and coloration I’ve enjoyed in this system. 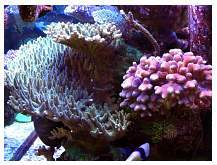 Three years ago the tank was stocked with small fragments and a few small colonies from my previous system. 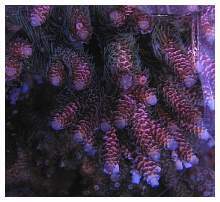 Today it’s virtually packed with large colonies, which produce multiple coral fragments monthly. 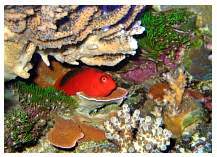 If you’re reading this, you know that keeping a captive reef is a rewarding, albeit often challenging, endeavor. 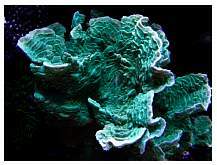 The system I’ve described is perhaps simpler than some of the amazing tanks I’ve admired here over the years; a system with no substrate, refugium, closed loop, algae cultures, chiller or computer control. I hope that you’ll agree that a simpler approach can result in a successful tank. As I write this, there’s talk of reorganizing the great room. Could opportunity be knocking again…?